Durham, Ontario is located at the intersection of Highway 6 and Grey Road 4 in the Municipality of West Grey, approximately 44 kms south of Owen Sound and 89 kms north of Guelph. 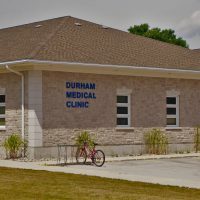 Durham has its own elementary public and catholic and schools, with graduating students then generally attending either Grey Highlands Secondary School in Flesherton or John Diefenbaker Secondary School in Hanover. Durham has an arena with a capacity of 3000 (often packed through the busy recreational hockey season), a public library, a vibrant and busy main street, a variety of active churches, a vet clinic, gym and an art gallery, and hosts annual Fall Fair and Homecoming celebrations that attract many visitors. 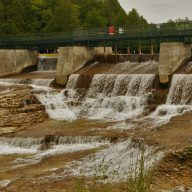 McGowan Falls is a popular spot for a swim on a hot summer day, as is the Conservation Area, both inside the town itself. Public service clubs abound in the small town and groups such as Girl Guides and Boy Scouts, the Rotary, Kinsmen and Kinettes, the Royal Canadian Legion and the Optimists date back as early as 1912.